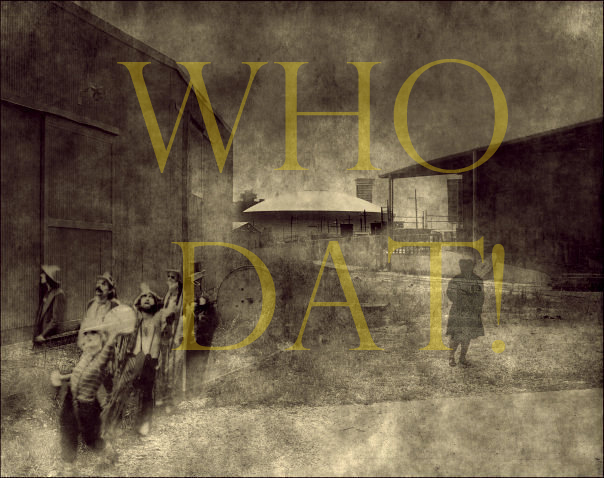 who dat New Orleans is a nation, and not the nfl, GEAUX SAINTS , WHO DAT? WHO DAT? This is New Orleans. A city founded by buccaneers, soldiers, and river rogues. We are the descendants of many nations. We came together to form the Who Dat Nation. We eat alligators, breathe hurricanes, and drink the Mississippi. We can outlast, outrun, and outshout anyone on this earth. Who dat? We dat. You..………. can’t buy dat and you don’t own dat! Yeahhhhh Saints!!! WHoooDattt?? Dats Who!!! !